DESCRIPTION Stunning 3 bedroom home is located on a quiet street and is located perfectly just beyond Par 3 11th Green at the Boulder Creek Golf Course boasting sweeping views of the surrounding countryside and golf course. 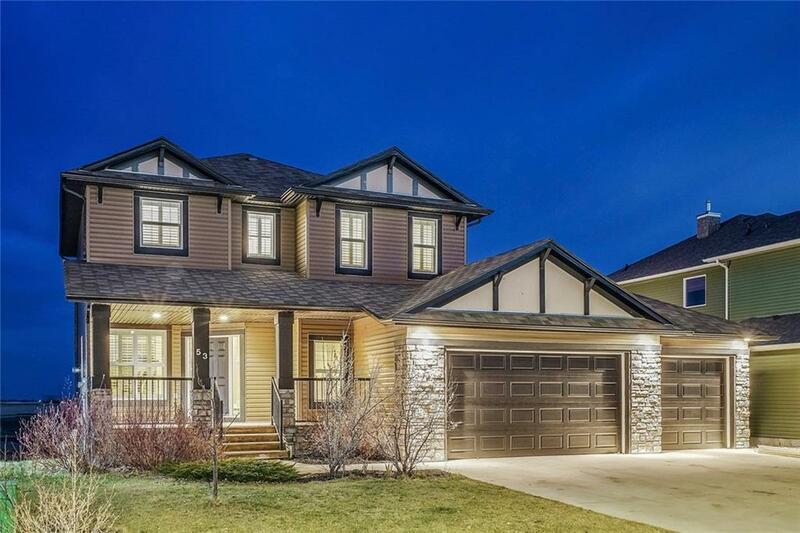 This upgraded home has a heated, over-sized triple garage and a partially finished walk-out basement. Main level is bright and open with a two-sided fireplace, a flex room and a large living room. You will love the newly finished hardwood floors! The kitchen and eating area is bright and spacious with a neutral shaker cabinetry profile, Yellow Moon granite centre island and a Stainless Steel appliance package. Large mudroom will accommodate the busy family and the walk-through pantry is a huge plus for great kitchen storage. Master bedroom is large and private with a 5-piece ensuite. Large bonus room on the second level makes for a great family room. This home has many upgrades including NEW high efficiency furnace, central air and newly painted walls. RO, Garburator and water softener included! Home for sale at 53 Boulder Creek Mr S Langdon, Alberts T0J 1X3. Description: The home at 53 Boulder Creek Mr S Langdon, Alberta T0J 1X3 with the MLS® Number C4217618 is currently listed at $539,900.